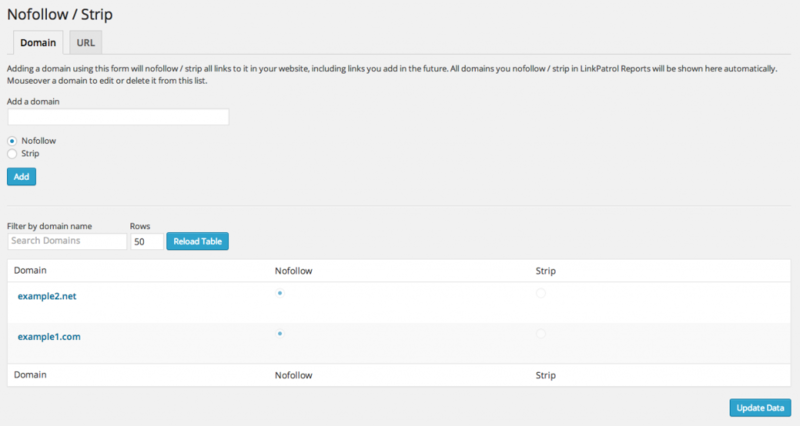 Nofollow / Strip page (LinkPatrol > Nofollow / Strip) lets you nofollow or strip certain domains or individual URLs. It will also display all domains or URLs you have nofollowed or stripped from LinkPatrol Reports (LinkPatrol > Reports). To delete a domain or URL from the table all you need to do is click Delete link. To edit a domain or URL, click Edit, make your changes, then click Update Data button below the table.